Lori was raised and lives in Lyme, Connecticut, where the interesting and layered history of the area – its founding families, shipbuilding, boating, river life, and art – have all had a profound influence on her work. In particular, Lori was intrigued by the Yankee ingenuity of local icon, Earl Brockway, a well-seasoned Old Saybrook man who spent his life building simple plywood skiffs. After Lori and her husband had their first baby, Lori was inspired by how the hull of a Brockway Skiff resembled the embrace of the womb – much like a woman’s body becomes a vessel during pregnancy. As a result, Lori developed a new sculptural sensibility which gave birth to her boat panel series which each incorporate a unique piece of an entire 16-foot Brockway Skiff. Every piece is a mixed-media piece incorporating all or some of the following media, printmaking, drawing, photography, sculpture and film. Each panel include the original assembly instructions, giving a nod to the completion of the boat and paying homage to Earl Brockway and his uncompromising pursuit of his craft. Using traditional printmaking techniques with her unique, modern purposes, Lori weaves her monotypes into breathtaking imagery. She achieves this by slicing and weaving images and strips of narrative into one another and layering papers and ink to develop subtle texture and complex patterns. Lori’s interest in weaving and quilting as a social craft for women is the foundation for her style of working with cut pieces of paper. She further explored incorporating photo imagery into her work when she was employed as a photoshop expert at a small design firm upon graduating from college. The hours spent looking at images as pixellated fields of color greatly influenced her work. Many of her pieces are notably provocative because of their size and freeform shapes. Once woven, the usual size restrictions inherent in printmaking become obsolete. Each piece starts as either a landscape or a portrait and has special meaning. The landscapes are about time and growth in nature. The portraits are about the complex structure of familial relationships and the impact of those relationships from generation to generation. Commissioned artwork in portraits and landscapes are offered on a limited basis. 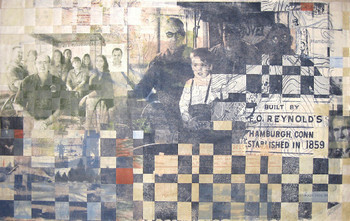 Portrait commissions incorporate imagery from your own personal photographs into the woven intaglio or encaustic painting process, resulting in a unique print or painting. A collectible, contemporary work of art for your family portrait. Landscape work is first created en plein air as a composition study in oil. Then, taken into the studio and interpreted into a larger piece in your choice of medium; oil painting, encaustic painting or unique woven monotype. Click here to email Lori to learn more about commissioning a woven monotype to capture your special memories, celebrate a special milestone, or to honor someone important to you. Lori’s modern twist is evident in her use of the historically significant medium of encaustic painting. Encaustic painting preserves and seals layers of transparent wax. Historically, it has preserved and colored mummies from Egypt and was used in a similar way on classical statues from the Roman empire. Lori’s work is luminous due to the many layers of wax used to add dimension, both physically and emotionally. 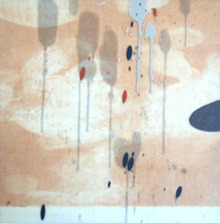 Her encaustics are often done at the end of a series of monotypes. The colors and representational forms allude to a specific person or landscape. Forms are inspired by the books Lori reads, the objects she observes in nature and those important in her life. Segments of her prints are frequently layered into the wax of her encaustic panels. A master printer in monotype, Lori’s work often references the landscape that surrounds her. This is particularly apparent in the vibrant colors and reflective qualities of her Bahamas monotypes. Since her childhood, Lori has spent the majority of her winters in the Islands of the Bahamas. In 2009 she partnered with Staniel Cay Yacht Club to begin a series of printmaking workshops held throughout the year. During these workshops, she also creates a series of her own work. Lori’s original monotypes and limited edition giclee prints have steadily developed a strong following. In this series she captures the essence of the Islands through the colors of the water, flora and coral island landscape. To learn more about Lori’s upcoming April 2013 Exumas, Bahamas Monotype Printmaking travel and art workshops see: Exploring Monotype in the Exumas Workshop Brochure. For information and to register email us.